Evening lights along Princes Street in New Town, Edinburgh. 28 April 2016 – As it turned out, the night was indeed dark and stormy, though not dark and stormy enough to keep the shutterbugs away! It was no surprise to see other photographers there when we arrived at the Calton Hill lookout just before sunset; after all, the popular public park does offer arguably the best panoramic views of the city of Edinburgh. What was a surprise though (and a pleasant one at that), was how easy the climb was – it’s only a short five minute walk from the base to the lookout. Getting to the hill is easy – it’s located at the eastern end of Princes Street in New Town. Those approaching from Old Town can get there using Jacob’s Ladder, a series of stairs carved right into the side of the hill. It is a steep and narrow climb however, with not much in the way of light during the evening so I highly recommend bringing a torch with you. The park is home to several iconic Scottish monuments. The photo below, taken just outside Waverley station, shows the obelisk shaped Political Martyrs Monument alongside Governor’s House. Looking up at the monuments on Calton Hill from Old Town. On the way up to the main lookout you’ll pass by the National Monument of Scotland. If the monument looks incomplete to you, it’s because it is… the project, which was meant to resemble the Parthenon in Athens, was abandoned in 1829 due to a lack of funds, leading to the structure being given several unfortunate nicknames, such as Edinburgh’s Disgrace. The National Monument, with Nelson’s Monument on the left. A shot of Edinburgh’s Disgrace (the structure, not me). The Dugald Stewart Monument (below) is perhaps the most photographed of all the monuments on the hill, appearing on countless postcards set against the stunning backdrop of the city. The clock tower in the middle of the frame is part of the Balmoral Hotel, a five star property located right in the heart of the city. Dugald Stewart Monument, with a view towards Edinburgh Castle. A note for photographers…there’s not much by way of shelter on the hill, so make sure you’re prepared for any rain. 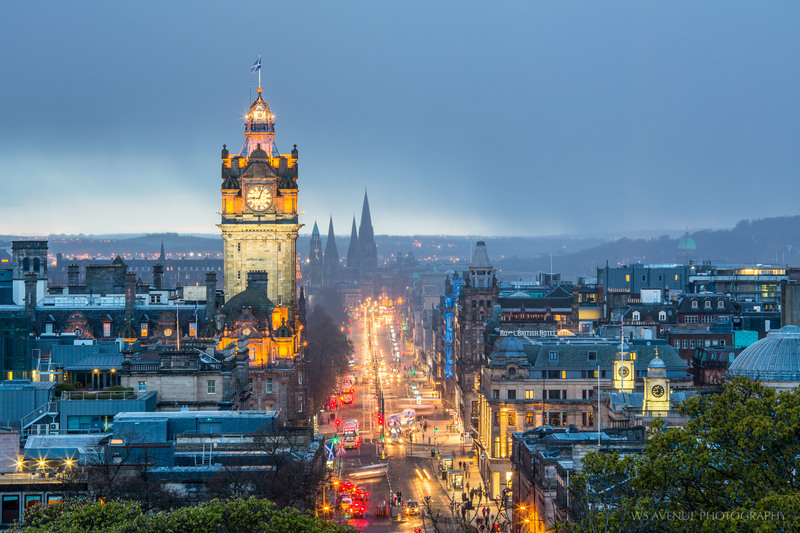 A view towards Edinburgh Castle, the Balmoral Hotel Clock Tower and Princes Street. It’s easy to see why Calton Hill is such a popular attraction for both visitors to the city and locals. The views from the lookout are simply breathtaking, and despite the inclement weather we had, it still turned out to be a great night of photography.